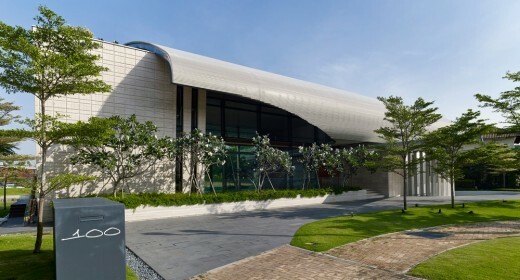 Commissioned by a family based in Thailand, the house is located in Singapore’s luxury seaside residential enclave of Sentosa Cove. Tired of staying in hotels on business trips to Singapore, the client wanted a holiday home away from home that could be used to entertain friends and clients. The brief called for the buildable area (GFA) to be maximised, whilst giving the feeling of space with generous living and entertaining areas. 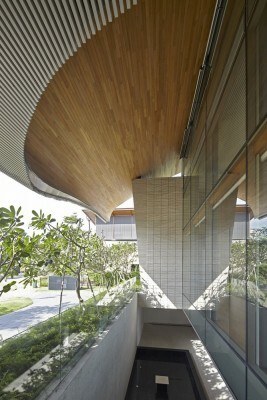 The house sits on a double plot facing a lake and an island green of Sentosa Golf Club. 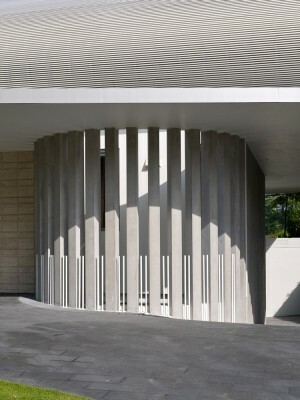 The starting point for the design was very site specific, to emphasize the primary views to the rear, whilst maintaining privacy along the road frontage. 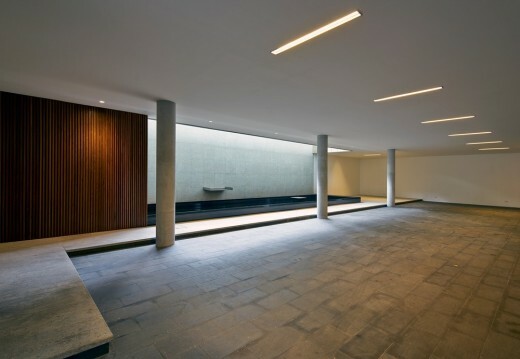 We anchored the house around a double height Living Room space, with panoramic views over the pool to the golf course. I firmly believe that every home needs a heart, a central space where the family gather, connect and communicate. All bedrooms spill into this double volume, and a bridge connects through this double height space to the Junior Master Suite. The Living Room also looks back on lush planting beside the entrance driveway which enhances the feeling of space but affords privacy from the road. 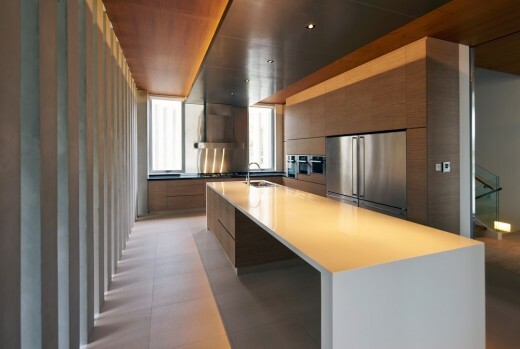 We wanted to have soft filtered light infusing this space, but to avoid the heat of the direct sun. 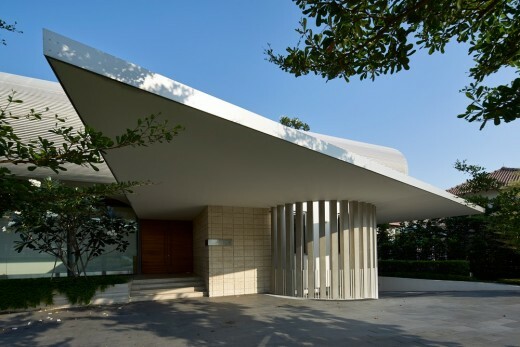 To achieve this a large overhand on the lake side shields the curtain wall glazing from solar radiation, whilst an enveloping wave roof form overhang opens up on the road side of the house to let diffuse daylight into the Living Room space. 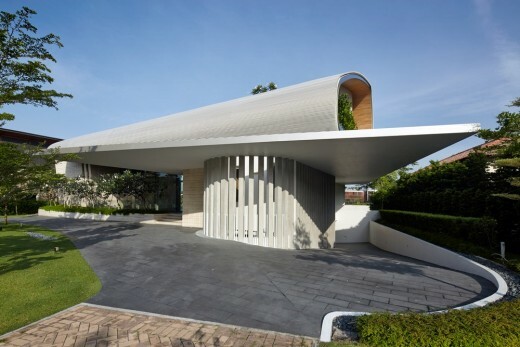 Being in Sentosa Cove, we wanted to instill a sense of fluidity and movement in the articulation and experience of the house, and therefore wrapped the house with a curved roof. 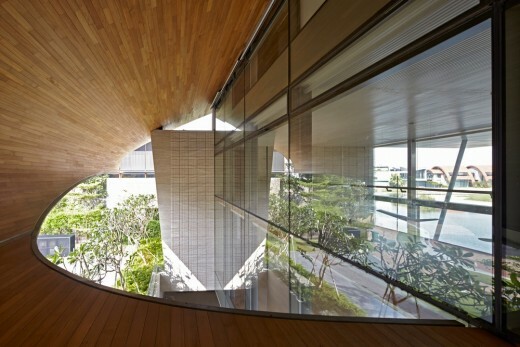 A portion of the roof was cut out to create an effect reminiscent of being inside a wave, which can be seen from the circulation stair and main living spaces of the house. We wanted all rooms to have a view of the golf course and pond. Where it wasn’t possible to provide views from bathrooms, we created private roof gardens so the bathrooms could fully be opened up to the garden. Being a multigenerational family, private zones are created within the home to allow family members to retreat and enjoy time together when they are not entertaining. The Family Room on the second level is more informal and surrounded by glass on two sides affording views of the lake, golf course and swimming pool below. 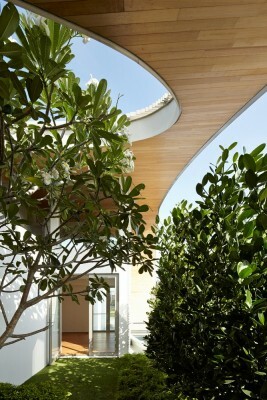 All doors slide away to open up the rooms to the sea breezes and cool the spaces down. 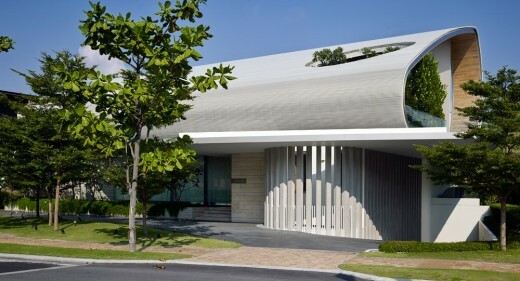 The Master Bedroom on the Attic Level has a large roof garden and roof terrace for sunbathing, and adjoins a private Study / TV Room, which spills onto balconies on two sides and enjoys magnificent views over the lake, golf course and beyond to the South China Sea. 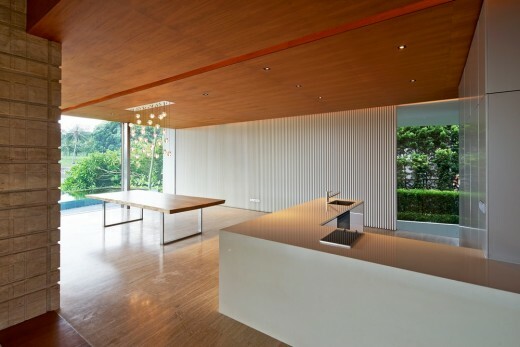 In the Dining area, an open plan kitchen and solid teak dining table overlook the 30m infinity pool and lake/golf course beyond. 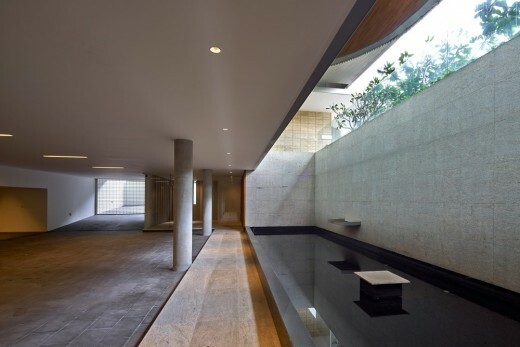 In the Basement a reflecting pond connects the space visually to the entrance through a triple height space, covered by the wave form roof over, which provides natural light and ventilation for the Carpark, which can park up to 10 cars. The Basement also houses the staff quarters and service/utility rooms. 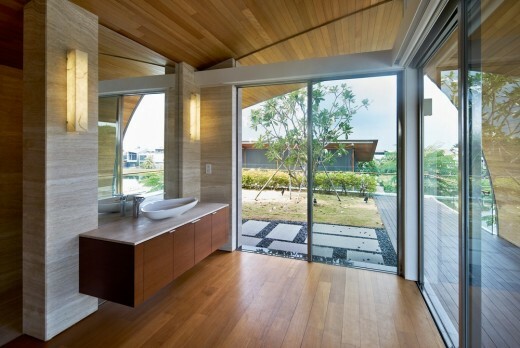 Master has a roof garden off the bathroom with Jacuzzi hot tub. The challenge was to try and accommodate all the spaces the client required, but not have the house look and feel too large. The house sits on a double plot, with a wide road frontage, therefore the articulation of the front elevation was critical. 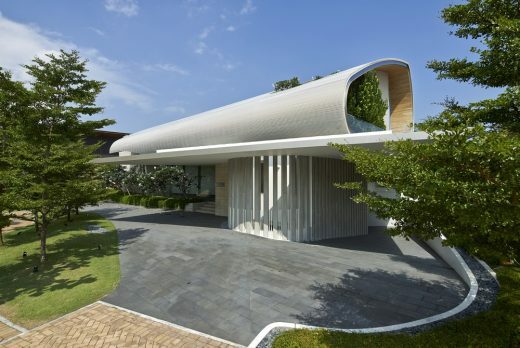 To reduce the massing of the house, we sloped the roof down so the lowest point facing the road, the curve of the roof helping to further soften the impact of the building mass. The integration of planting on roof gardens at the on level 2 and Attic level helps nestle the house into the surrounding landscape. A hole was cut into the curved roof for a large tree to protrude from the level 2 bath court. 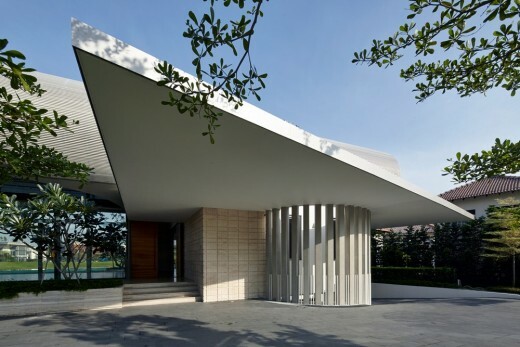 On the lake side the wave roof form unfolds to open up the views of the pool, lake, golf course and South China Sea beyond. 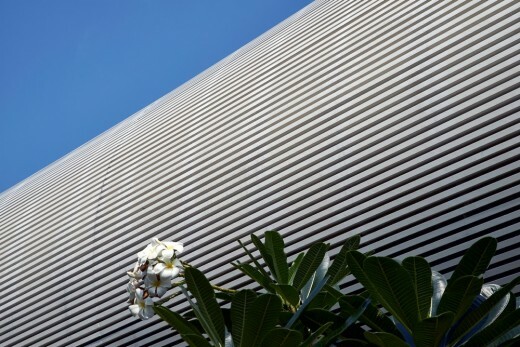 We didn’t want the architecture to compete with the abundant water and garden views around the house, and therefore we selected a soft off white palette for the exterior and interior of the house. Instead of imposing colour, we decided to add texture to the surfaces of the wall and ceiling to articulate the natural light. We selected light ivory travertine, (which we took pains to select to ensure a consistent colour, tonality and with minimal holes), and groove cut this into a modular 450x450mm pattern that would clad external and internal walls. The groove cuts give depth to the stone, and add texture to the walls which is emphasized when light is cast onto the walls. 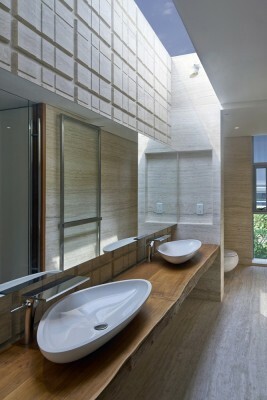 Burmese teak was specified to compliment the ivory travertine and add a homely warmth to the spaces. Only in the swimming pool is there a touch of glamour. 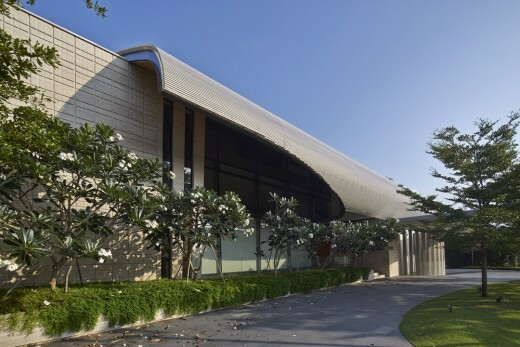 We chose iridescent SICIS gold pool tiles for the swimming pool, a reference to the owners being from Thailand, and 24 carat gold pool tiles for the shallow end of the pool, which glimmer a resplendent gold under sunlight. We selected solid natural teak slabs with natural edges for bathroom vanity counters to give a rustic nautical feel to the bathrooms. The Dining Room table was also custom made from recycled teak from the same source. 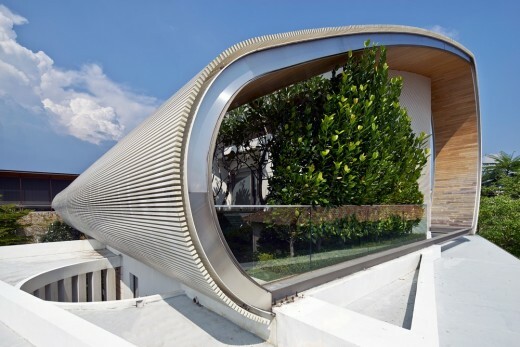 •	Integration of Roof Gardens at all levels, which helps to insulate rooms below and reduce direct solar heat gain. 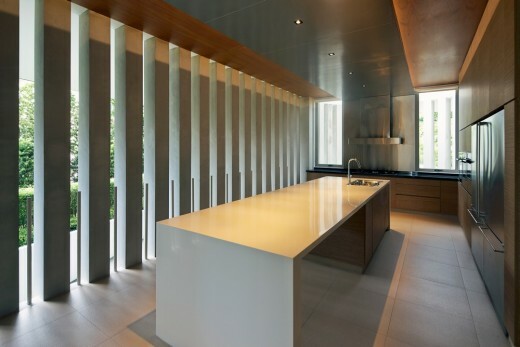 •	There is very good natural lighting for all rooms, reducing the need for artificial lighting during the day. •	There is ample cross ventilation for all rooms, with sliding doors that fully open up for natural light and ventilation.